Facebook’s Algorithm Changed. Here’s What Marketers Need to Know. Due to the limited space in your News Feed and the overwhelming amount of content, Zuckerberg is changing the News Feed algorithm to show less viral memes and more pictures of your sister’s dog. Facebook wants the platform to be more about interactions and dialogue that mean something to the user. It will prioritize content from family, friends and groups that spark high engagement. That means, in turn, Facebook will show less public content. We see this as a challenge but also an opportunity. With this update comes a push for brands to not only create better content, but to create content that your target audience actually wants to see and interact with. Social is inherently emotional, so tell stories. Stories are high-engagement pieces of content that people love to share. Facebook has said that long comments will be worth more than likes, so make content that ignites a conversation. If you have just been sharing links to articles related to your industry, it’s time to diversify your content, shake up what your News Feed looks like and create your own content. You don’t need more content, you need better content. It’s okay to scale back your frequency in order to produce better content. The goal is quality over quantity. We’ll also continue to see a decrease in the value of organic content, which creates a more competitive pricing landscape for paid content and ads. Let’s be real. Yes, this update is supposed to be about enhancing the user experience, but it’s also a way for Facebook to bring in more money from advertisers. With all the content on Facebook competing for News Feed space, your organic reach is only at one to two percent of your total audience. If you’ve been relying solely on organic, it’s time to finally join the paid advertising world. And those who are already dishing out dollars will have to adjust their budget and master targeting to outbid the competition. Or, we can do it for you. This update means content that is timely, relevant and invites a user’s opinion will perform best. But, be careful. Engagement=good, engagement bait=bad. Facebook will still be demoting engagement bait content. For example, posts that read, “Like or Comment if you think puppies are cute!” will not count as meaningful interactions and will likely not appear in your audience’s News Feed. One option to stay in your audience’s New Feed is to ask them to choose to see your content. Encourage your followers to choose the “See First” option in their News Feed preference options in an honest, authentic way. Join and create groups. This allows an audience to share a space concentrated on a common interest to share ideas and engage with relevant content. Create groups around niches related to your brand, invite followers to join and start a conversation. Make live videos! Live video is still valued as priority content as they are often a popular medium to invite conversation in the comment section. In fact, live video on average gets six times as many interactions as regular videos. Figure out a good story or fun event to share, tease the time you’ll be live and encourage people to watch you, then go live! Another recommendation is to make your Facebook page as mobile-friendly and experiential as possible. Facebook wants users to stay on Facebook, so play the game. 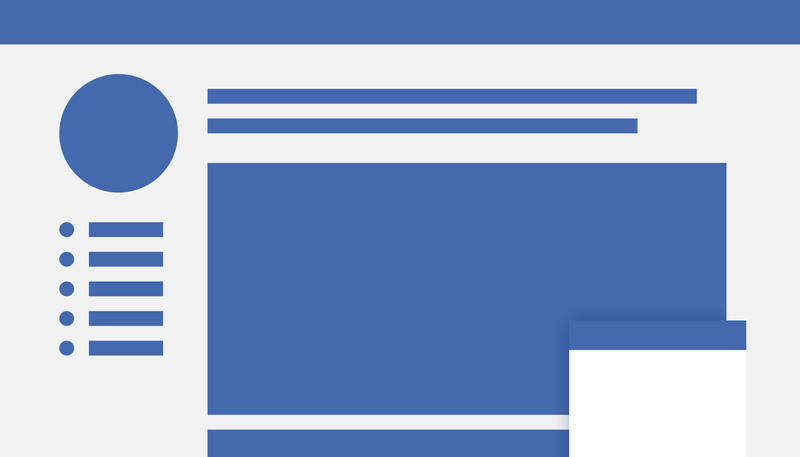 Facebook will not favor content that links to external pages. Use Facebook Instant Articles to repurpose your blog content; use Messenger chatbots to address leads faster; use Canvas ads as mini mobile experiences for events, products, or stories; make videos on your mobile phone that you can upload instantly and natively to Facebook. Mobile-first, right? Need more information on native content? We’ve got you covered. That’s it. Now go evaluate your content strategy. Make some tweaks and put the work in. There’s no reason to become discouraged by this update. See it as an opportunity to reevaluate your content strategy and get to work creating stellar content.